There will be a longer item on the GDPR in the Summer Newsletter due out at the end of May 2018. In the meantime we have been asked to put this item on the website now, particularly to assist Group Leaders. We were already following the guidelines of the previous legislation, the Data Protection Act 1998. We have checked with National Office and read pronouncements from the Information Commissioner. No major changes are necessary for us at Kingston U3A or Group level because of the limited sort of data we hold, but we will amend the renewal form to make it clearer how we use your data. – There is no need to get written consent from your Group members to keep the list of names and contact details which you need to administer the group. If you have already done this, that is OK, so do not worry. – The only change you need to make is to send email circulars blind copy (bcc) unless all Group members agree otherwise, verbally. – Destroy old lists containing personal details of U3A members unless you anticipate a real need to keep them. We are initially recommending 2 years pending experience. I need to keep your Gift Aid declarations for 6 years under other legislation from HMRC. Image by Alfons Åberg, via Wikimedia Commons. 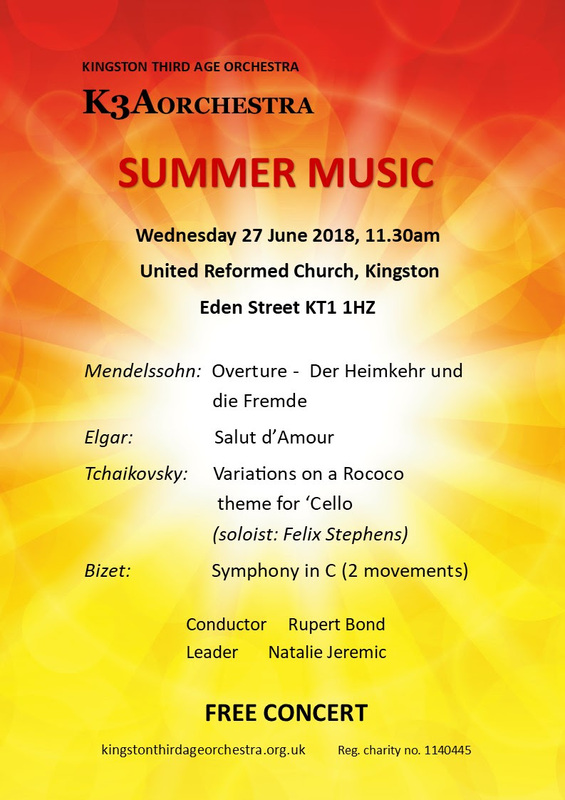 This year’s informal summer concert will take place at 11.30am on Wednesday 27th June at our usual venue in Kingston United Reformed Church. We have a varied programme with pieces to please everyone, some familiar some less so. Listeners who know Mendelssohn’s Heimkehr aus der Fremdemay notice a few additions to accommodate the particular composition of our orchestra. In Tchaikovsky’s Variations on a Rococo Theme we will be joined by the soloist Felix Stephens. And we will also be playing Elgar’s Salut d’Amouras well as movements from Bizet’s Symphony no. 1. It’s a short and informal affair and an opportunity, we hope, for families to come along and hear us play. We’d love to carry on sending you updates on the orchestra’s concert programme, but to comply with the new data protection requirements (which come into force on 25 May) we need to confirm that you want to continue receiving them. We hope that you are still interested in our orchestra. If you have not done so already please update your subscription settings by clicking on the button below. Note that on the update page you need to click on the “email” checkbox to carry on receiving our newsletters.